Summary Dual-boot Android and Windows 10 inch tablet that seems to get everything wrong. I was excited to review the ViewSonic ViewPad 10. After all, it has two separate operating systems and several more connection ports than other tablets. My first thought was this tablet is going to be different and fun to work with. It turns out the ViewPad 10 does stand out from the crowd, but for all the wrong reasons. I should have been tipped off this tablet was going to be disappointing once I opened the box. Unlike other packages, this one was cheap and flimsy. The tablet was wrapped in a protective cloth and sat on top of the plastic shielding that housed the power cord, instruction booklet and software CD. Weighing in at almost two pounds, I found the ViewPad 10 is cumbersome and difficult to use for longer reading or browsing sessions. The quality of the 10.1" screen leaves much to be desired and the overall feel of the device is that it was thrown together. 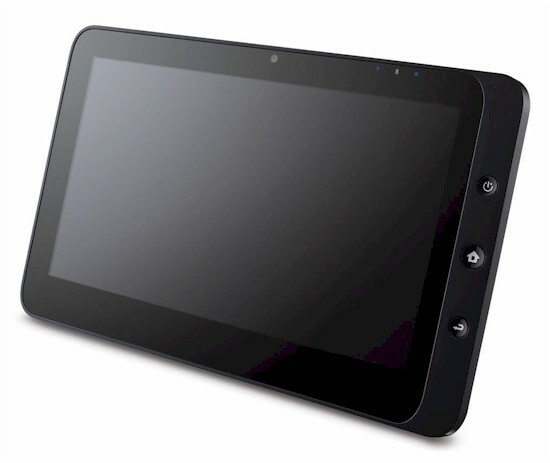 At first glance, the ViewSonic ViewPad 10 looks on par with other tablets of the same architecture. There is a shiny black reading surface that looks nice and a brushed metal backing. Powered by an Intel Pine Trail N455 1.66 GHz processor and 2 GBof DDR3 RAM, the ViewPad does have the power to handle everyday use. The model I reviewed, VPAD10_AHUS_05, came with Windows 7 Home Premium and Android 1.6 (!) installed with an internal 16 GB SSD (Solid State Drive). ViewSonic's website shows there are two different models. The other version, VPAD10_APUS_05 has Windows 7 Professional and a larger 32 GB SSD installed. The 10.1 1024x600 LCD display provides a barely adequate viewing experience. The viewing angle is quite narrow in comparison to other tablets that boast the same resolution. When tilting the tablet in any direction, the display quality is severely diminished. This takes away from being able to use the device for reading as it hampers your ability to adjust the viewing angle. Visually, the quality of the display is sub-par and far below what I would expect from one of the pricier tablets on the market. There are pixilation issues that are noticeable and the color does not seem as vivid as most tablets I have worked with. Another curious design flaw is the camera and how it is used. Most tablets offer front and rear cameras to facilitate video chat and taking pictures or higher quality videos. Apparently the engineers at ViewSonic forgot about this. The ViewPad 10 only has one front facing 1.3 MP camera. It is underpowered, has no flash and is virtually useless for taking photos. Connectivity is provided through a single band 2.4 GHz 802.11 b/g/n radio and Bluetooth. 3G and 4G WWAN options are not available. Power is handled by a Li-ion 3200 mAh battery rated for 4 hours of continuous use. The enclosed power cord separates into two pieces and provides roughly six feet to work with. Not fun. That is the best way to describe the clumsy interface and horrible controls that you have to endure while using the ViewPad 10. Out of the box, the ViewPad 10 can be booted into either Windows 7 or Android 1.6. Both options are not optimized for tablet computing and present many challenges that most people would rather not bother with. Holding the tablet is uncomfortable. Along with the heavier weight, the edges are not rounded and the ViewPad has a tendency to dig into your hands with its rough edging. Holding this device becomes laborious and viewing angles make adjusting the reading plane next to impossible. The screen is barely visible when used outdoors and the front of the tablet attracts unwanted fingerprints. Booting into the desired OS is not straightforward and requires the input of the control buttons on the tablet. If you mistakenly boot into the wrong OS, you have to shut down the tablet and try again. I feel this interface could have been done better. Wireless connectivity is not difficult, but it is handled differently depending on OS used. Some users may find it complicated to find the same desired features on two separate platforms. Internet connections need to be configured separately as do other customization features. If you customize one OS, those settings do not transfer over to the other. If you decide to use the 1.3 MP camera, you will need to store your pictures on another form of media like a micro SD card. For some strange reason, the ViewPad will not allow you to store your pictures locally. Simple functions found on almost all other tablets are mysteriously missing on this device. This makes it harder to use and frustrating to troubleshoot.